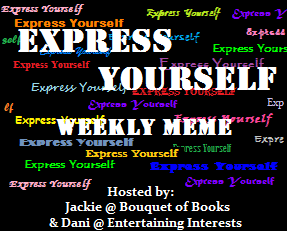 The Express Yourself Weekly Meme is hosted Bouquet Of Books and Entertaining Interests. This week's topic is: Name a few things you like to eat while writing. I am ashamed to admit it but I have a major Cheetos addiction. That and chocolate and I could survive locked away writing in a cabin for months. Well and coffee of course. I think I have that same addiction...to Goldfish Crackers and chocolate!